A jealous boyfriend pushed, grabbed and pinned his former partner down after he suspected she had been unfaithful to him. 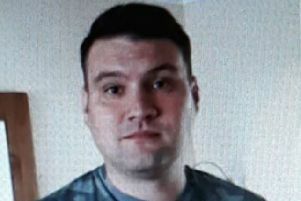 Chesterfield magistrates’ court heard on Wednesday, October 19, how Wayne Steven Hutsby, 35, of Old Coppice Side, Heanor, attacked his girlfriend at her home on Watkinson Street, Heanor. Prosecuting solicitor Chris knowles said: “They had been in a relationship for six years and have a five-year-old child. Mr Knowles added that Hutsby grabbed the complainant around the throat and pushed her on to the sofa and held her by her neck and as she screamed he put his hand over her mouth while holding a metal plate. Hutsby was arrested and made full and frank admissions to the police and also admitted having previously damaged a window blind, a bedroom door, lamp and walls at the complainant’s home earlier in September. The defendant pleaded guilty to the assault from September 26 and to causing criminal damage from earlier in the month. He also admitted committing these offences while he was still subject to a two-year conditional discharge for an offence of fraud by false representation. Defence solicitor David Gittins said the complainant retracted her statement and said she did not support the prosecution but Hutsby admitted the offences. He added: “The defendant had difficulties a few years ago with drugs but he’s resolved this and he has been drug-free and deserves credit. “As a result that drug abuse had a significant impact and there was an element of paranoia and that’s the underlying issue why there are arguments and he doesn’t trust her and with drugs there are sadly long-term effects. Mr Gittins added that Hutsby also broke down when he was being interviewed by police and expressed remorse. Magistrates viewed the incident as a “sustained attack” with threats to use the plate as a weapon. They sentenced Hutsby to 18 weeks of custody suspended for 18 months with a Building Better Relationships Programme and a Rehabilitation Activity Requirement with 100 hours of unpaid work. Hutsby was also ordered to pay a £115 victim surcharge and £85 costs.